Former Swansea City midfielder Ferrie Bodde became "very emotional" when he saw footage of the club's fans chanting his name at the weekend. Bodde, 31, had been in an induced coma after being diagnosed with pneumonia. He was able to see fans' support for him during Swansea's 4-1 Premier League win over Aston Villa. "He didn't realise that there are so many Swans fans still thinking about him," said Bodde's spokesman, Jeroen Van Eijndhoven. "He had no idea so he was really touched when he saw those pictures." Fans of another of Bodde's former clubs, ADO Den Haag, also observed a minute's applause for him before their Dutch Eredivisie match against Az Alkmaar. Van Eijndhoven says Bodde remains very ill in hospital. "He's only talking to his family and to close friends - just small talks because he's very tired," said Van Eijndhoven. "He's out of his coma so that's great and he's getting better day by day, but one step at a time. "We didn't manage to get a live stream so that was very bad because he really wanted to see the game. "But we managed to show him some fragments of the game via social media." Bodde has become head coach of Dutch amateur club SV Wateringse Veld after being forced into retirement by injuries. Van Eijndhoven added: "He can't play football himself and that's bad enough, but he wants to be a professional trainer." 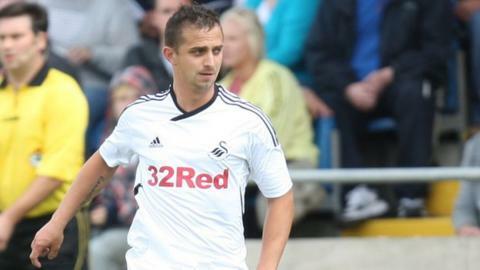 Bodde joined the Swans under then-manager Roberto Martinez in June 2007 from Den Haag for an initial £50,000, and left in July 2012 after suffering three cruciate knee ligament injuries during his time at Liberty Stadium. Between November 2008 and his departure, Bodde played only four first-team games for the Swans. As he left the club, chairman Huw Jenkins said of the player: "He would have been one of the best players in the Championship and probably one of the best in the Premier League barring the injuries." His displays attracted interest from Derby County, Middlesbrough and Reading, while in subsequent seasons Swansea had to fend off bids from Wigan Athletic and Bolton Wanderers. After leaving the Swans, he attempted in vain to resurrect his career at Wigan and Den Haag.